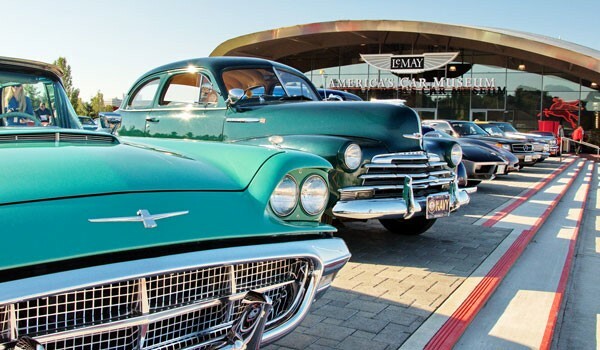 This summer, exciting things await Puget Sound car lovers at LeMay – America’s Car Museum. Throughout the summer there will be day camps, a superior muscle car exhibit and more, meaning visitors will need more than one day to soak it all in! Have you always wanted to race a car to see if you have what it takes to be the best? If so, you’ll be able to test your skills against other drivers during Race Nights at ACM, on the second Thursday of every month from 5 to 8 p.m. CXC racing stimulators will provide the thrill of racing on famous tracks like Daytona and Darlington. Drive solo or put a team together and race on. Kids 8 to 15 years old can sign up for a Race Into Summer camp. This week-long course immerses soon-to-be drivers into a world behind the wheel, all before their first driver’s ed course. Better hide the keys, Mom and Dad! Anyone wishing to learn more about their favorite classic autos will not want to miss “If Cars Could Talk,” a brown-bag series that dives into the history of one particular vehicle. Attendees will get a glimpse into the history of one car, selected by the speaker, over lunch provided by the museum. One of the biggest exhibits to hit ACM is American Muscle: Rivals to the End, featuring coveted cars like a 1969 427 Yenko Camaro and a 1970 Dodge Super Bee. “To highlight this incredible time of American history, the museum is going to display ‘halo’ cars from all of the major American brands,” says ACM President and CEO David Madeira. Enthusiasts will be in awe of this sensational collection, he says.